American Heating Company designs and manufactures industrial heating solutions for companies around the world. They reached out to Mannix Marketing with the ultimate goal of finding a way to attract more leads from the web. The solution was clear, redesign to increase conversions. The new website incorporates professional images to visually communicate American Heating Company’s wide range of solutions and the target markets they serve. Stronger visual and verbal messaging was designed into the site to help communicate the factors that separate American Heating Company from their competitors in the manufacturing industry while reinforcing the brand’s professional reputation. 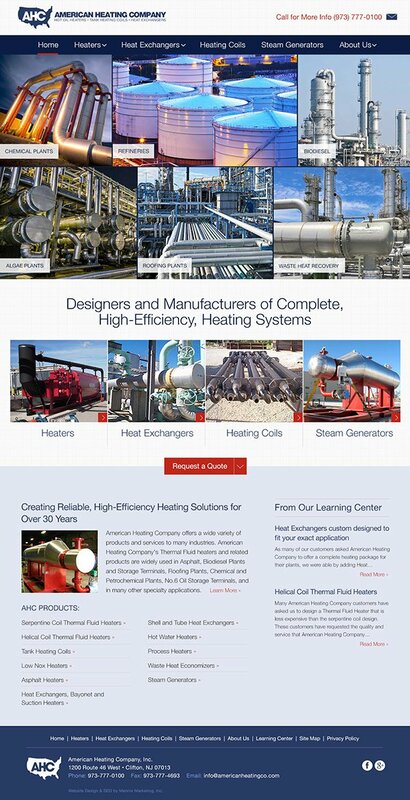 Today, American Heating Company’s website is more visually appealing, as photos of their heating solutions- including heaters, heat exchangers, steam generators, and more- accompany the text-based descriptions. As more buyers are using smartphones to search for businesses online, having a mobile-friendly website is no longer an option- it’s a necessity. In fact, Google now rewards mobile-friendly websites with better rankings in the search results.